A friendship afghan is a blanket made up of friendship squares. 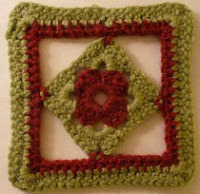 Friendship squares are knitted or crocheted motif squares, granny squares, or other squares that are given to or traded with friends. Looking for free square patterns? The Friendship Afghan Project features a different knit and crochet square pattern each day. Bookmark this website or subscribe to the RSS feed to stay up-to-date.